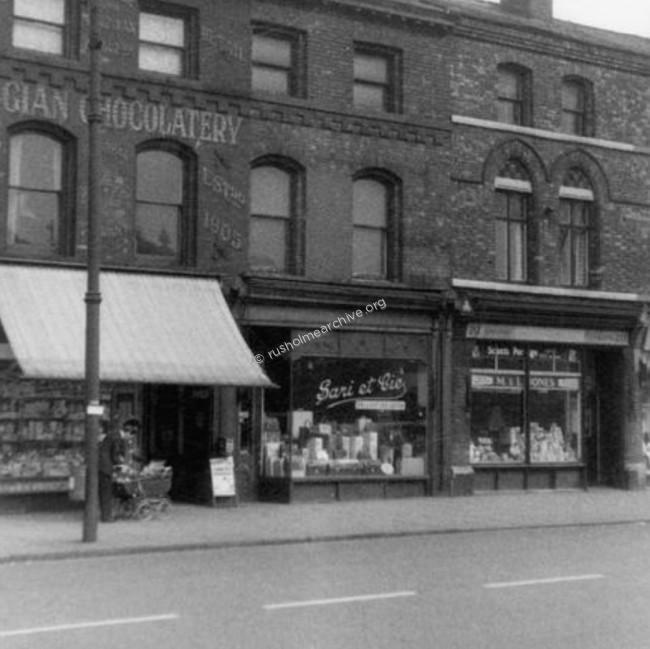 Grocers by trade, Llewelyn and Mabel Jones opened a shop on Wilmslow Road, Rusholme in 1956. Their memories reflect a different age of shopping, and, although still comparatively recent history, a different Rusholme. 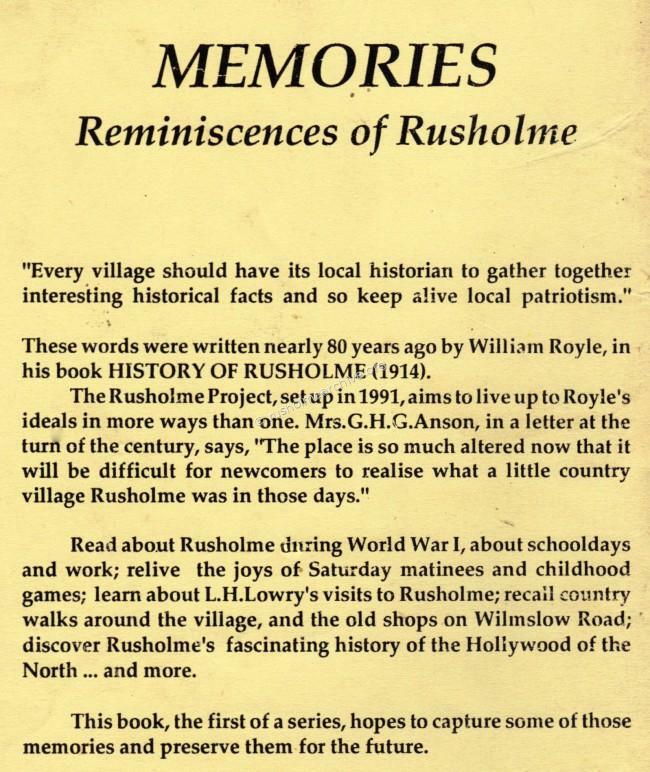 The following is their reminiscence that was part of the Rusholme Project started in 1991 at the Birch Community centre with the intention of collecting memories of local residents. Llewelyn: I was proprietor of the grocer's shop on Wilmslow Road. We bought it as a going concern...1956 we took over, and ran it for 15 years. We met a tremendous amount of different types of people. Our customers were mostly upper middle class; we had such as Sir John Barbarolli, and Lord James of Rusholme, headmaster of Manchester Grammar School. And we used to serve the Baptist College on Wilmslow Road, and John Dalton, the halls of residence. Mabel: When we first went there, just a matter of months before we took over, to go to our back entrance to the premises we had to have a key to get into Victoria Park [through Park Crescent]. Llewelyn: The type of people living there then, they wanted a little bit better service than the average; that was why we did very well, we catered for them, and the better class style of foods. We specialised -we used to stock all different types of cheeses, all the different types of bacon, we had them all there, and the people used to come; they knew they could get what they wanted. We bought in bulk - whole cheeses; bacon, of course, I used to do all my own boning and rolling. We didn't pack tea and sugar - we had packed our own tea with our own labels and all once. Of course all that kind of trade dried up with pre-packaging. When we had the two other shops, we more or less told them what they were having. We used to buy from different firms and if we got a good do with them, well the customers had what we had in the shop. But when we went to Wilmslow Road it was totally different. They told us exactly what they wanted, and if we didn't have it they'd go elsewhere. Fortunately, there was nowhere else near us, so they had to come back to us in the end! Wilmslow Road was all private shops then. There was just one shop - Redmonds, down the bottom end - it was the only multiple shop in the whole area; a grocer's, similar type of shop to our own, only that was more or less a working class shop, like the Liptons and those sort of firms. Mabel: On the corner was the Italian Consulate. They had a glove manufacturing business, and they sold gloves and handbags, that sort of thing that they'd made, but it had a sign outside saying Italian Consulate, and an office upstairs. All the men were interned during the war. Llewelyn: The Belgian Chocolate Shop was next door but one to us. They sold hand-made chocolates. People used to go in there and buy a quarter of chocolates, but they wanted one of those, and one of those. They had little silver tongs, and they used to pick them up and put them on a little boxed tray and then they'd fold it over and put a little bit of silk round it. And that would cost them - whereas Cadbury's might say be a shilling a quarter, or a good bit less than that actually, theirs would be 2/6 for the same weight. In 1956, any mortal thing you needed you could purchase practically on our block. There was one of everything - greengrocer, stationer, ironmongery, butcher. They were daily shoppers the majority of our customers. Llewelyn: He used to come into the shop sometimes and he'd peep round the corner and shout, 'Mr Jones, is your wife out? Oh well, I'll come in then, because I only want one article, and if she's there I have to buy two or three!' She was a proper tyrant with him. Mabel: But you see they were pleased you'd reminded them - you know they'd get home and find they were short of something. I didn't press them, it was courtesy selling, personal service. And they used to enjoy coming. The same people used to come, say on a Thursday morning, and they used to get to know each other, have little chats in the shop. They enjoyed it, especially people who lived on their own. Llewelyn: Oh yes, we had no end of people used to say,' Has Mrs So-and-So been in yet? Oh, I'll wait a few minutes to see them.' And we'd have two or three people, been served, waiting in the back of their shop for their friends to arrive. We opened 8-30 till 6-00. Before the war it was long hours - 8-30 till you closed. Saturday night it would be 10-00, 10-30 before you closed. We worked hard. We delivered by car, and we had a bicycle and an errand boy. We used to pack a lot of our own goods, but slowly they started coming already packed. So our wholesalers were jumping on the bandwagon; they couldn't even supply us with bulk. The supermarkets killed it really. Everybody's working today, but in our day a wife was a housewife, so she used to come out practically every day and buy sufficient food for that day. That was a ritual with her, part of her living. Going shopping was a big thing, but today it's a chore, it's get a trolley, fill it up quickly, and get off home that's the attitude. But theres not many decent grocers' shops any more. But we had a lot of fun. We enjoyed our work. We knew all our customers by name, and you could set the clock by most of them. In the photograph above, taken in 1958, the shop that Mabel & Llewelyn Jones had is on the right of frame, the Belgian Chocolate shop is on the left. The photograph is from the Manchester Libraries 'Images' collection and I appreciate being given permission to publish the photograph in the rusholmearchive. Published under the title of MEMORIES: Reminiscences of Rusholme by ID Books. I would like to thank Clive Hopwood, the Editor for being given permission to reproduce Llewelyn and Mabel’s memory here on rusholmearchive.org. Sadly Mabel & Llewelyn are no longer with us but their two sons have kindly agreed to the memory being published.